Soviet model trains - collectors' items - Even 3-rail! I’m glad to present my short overview of the Soviet model railways and trains manufactured in 1930s-beginning of 1990s. I presume these models are overlooked by most model railroaders from the Western world. This is quite understandable: in most cases quality of the models presented is far from Marklin and other top brands and they were available in the USSR only. However, I would say, generations of the Russian modellers (and children) grown-up on that stuff. And thus it’s important part of our history. Also I know that many Western collectors are looking for these models which are actually very rare items nowadays. In my opinion, just four, let’s say “major acts” of the Soviet model train industry worth to be mentioned here. And I’m wrong saying about “Soviet model train industry” - it actually never existed. All models were produced by machine-building or instrument-making factories as an accessory stuff. Please note: when I'm saying about today's offers - it doesn't mean that I'm somehow connected with selling of the items. 1. Model railway by “Press” factory, Serpukhov. 1937-1941. The first Russian model railway. Presumably based on Maerklin stuff studied by the Soviets. Current status: extremely rare collector’s item. Some parts available at the Russian web auction. Today’s offer: loco’s chassis with motor and 7 freight cars – 1370 US $. 2. 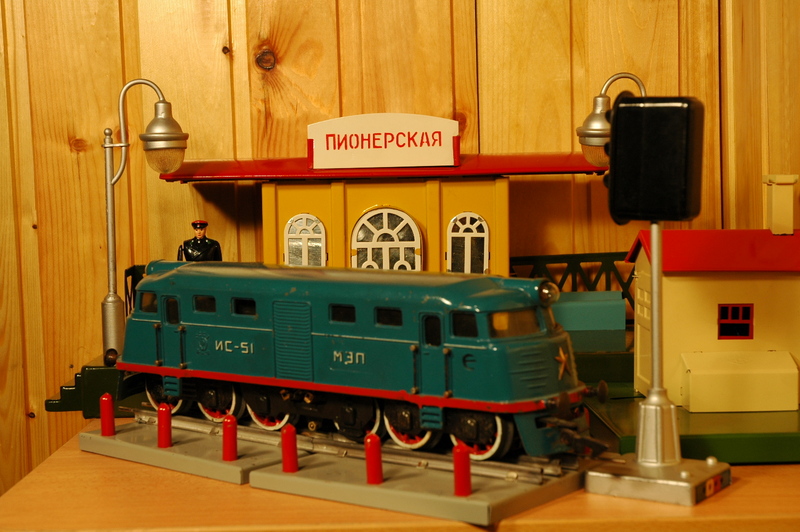 Model railway “Pionerskaya” by “MosKabel” ("Prozhector"?) factory, Moscow. 1951-1969. “In 1951 the Soviet Union began producing 0-gauge model train sets that (until recently) have been largely overlooked by the train collecting community. The sets made during the '50s included an engine with Joseph Stalin's initials on the sides and are known today as "Stalin-era" trains. The sets made in the '60s included a plainer-looking engine without Stalin's initials and are known today as "Khrushchev-era" trains. These rather enormous sets contained a diesel-type locomotive, two passenger cars, two freight cars, three street lights, three signals, a large station, a bridge, three operating accessories and various other items (including a transformer, track, switches and wiring) required to operate the trains -- all packaged in a large wooden crate! 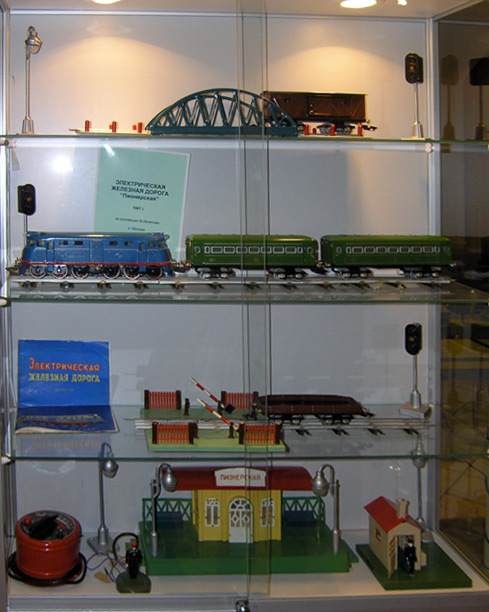 Some of the set components are clearly recognizable as copies of items produced by other model train manufacturers while other pieces appear to reflect unique designs created by the Soviets. For example, the engine clearly follows Soviet and Eastern Bloc design. In the years following World War II, the USSR had to focus on rebuilding their country, making food and other essentials available to their inhabitants and strengthening their economy. With housing, eating, clothing and looking for work being foremost in the minds of the Soviet people, it is surprising that the Soviet government would expend time and energy to fabricate what would appear to be a non-essential, luxury item. Thanks to a modest amount of research that has been done over the years, that small mystery has been solved as collectors have learned that the train sets were not intended to be sold -- at least not initially. The first Stalin-era sets were used as gifts to party members, high ranking military officers and foreign dignitaries. They were also used as rewards to adolescent boys who were members of the "Young Pioneers" - a youth group that was the communist equivalent of the Boy Scouts. My small correction: in the 1960s "Pionerka" was also available at the large toy shops in Moscow (at least), but costed 36 Soviet Roubles (while average salary in the country was around 90 Roubles). Thus it was simply not affordable for the majority of children and their parents. But it was a real SUPER-TOY! Full set in action! Video by the owner of the set in excellent condition (with Russian comments). He’s got his set in 1958. Watch until the end, please, that’s interesting (and funny)! Current status: collector's item. Some parts as well as full set available at the Russian web auction. Full set: 2816 US $. By the end of 1960s Piko predominantly captured the Soviet market. Eastern Germany became the large supplier of toys and hobby products to the USSR – these products by East German state-owned companies were the part of GDR’s payments for the minerals, heavy machinery and other stuff from the USSR. And it was almost the end for the local manufacturers. Quality of Piko products was higher than “Pionerskaya”, and Piko offered wide range of gauges, locos and rolling stock. 3. “Ov” Russian steam locomotive, two 2-axle passenger coaches, controller and rails (14 pcs) set. “Schetmash” factory, Kursk. 1982-1991. This HO-gauge DC set was designed and produces as add-on to Piko stuff. The prototype of the loco was famous Russian “Ov” steam loco designed in 1890. Coaches were also based on the real prototypes. External look of the items was very good: nice running gear, handrails, detachable parts, precise lettering. 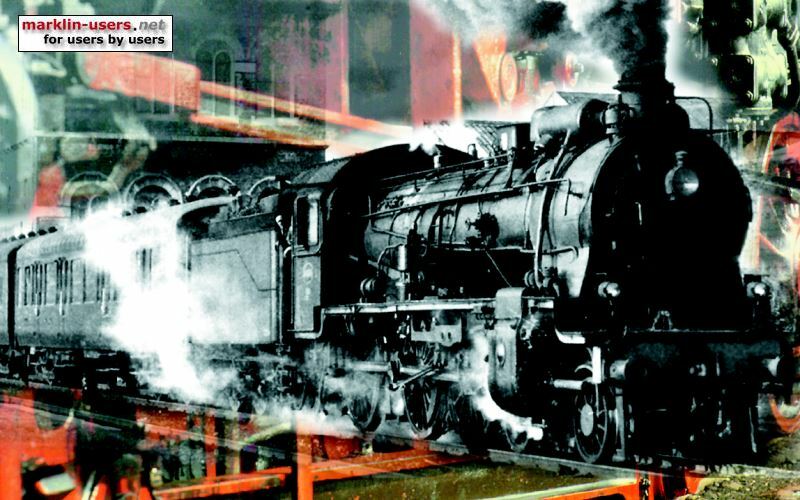 Besides the coal tender, later steam loco was produced with wood-fired, oil-fired and four-axle coal tenders (road numbers were the same). Various locos were available separately. But running characteristics were not so enjoyable. Motor placed in the tender required much amperage but had low torque and was very noisy. Transmission required much greasing and worked unstable in the curves. Rails were actually copies of Piko products but not as quality made. The issue of quality was very important. The manufacturer didn’t manage to provide acceptable quality during production, therefore great amount of products used to mark as “flaw” and rejected. Nevertheless, “Ov” sets were very popular in the USSR and even exported to Germany. Production ceased upon USSR’s collapse in 1991. Current status: second hand items easily available. Today’s offers: 200 US $ for 1 steamer, 400 US $ for the full set plus one extra coach in excellent condition. In 1982 “Schetmash” announced and commenced limited production of one more loco – TEP-10 Soviet diesel locomotive. This item was regarded as not successful since model had serious discrepancies with the prototype. Locos were produced in very small numbers and are rare collectors' items nowadays. DR-1a diesel train by “Sokol” factory, Belgorod. 1992-1993. The prototype of this DC four-unit model in H0-gauge was DR-1a diesel train, designed in 1963 in Riga (Latvia), mostly used in the Baltic States, Ukraine and Belarus. The model was designed in Soviet times, but presented and marketed already in 1992-1993. The boom around new model was enormous. External look of the train was regarded as an exceptional, painting, detailing (including interior details) and lettering were excellent (in the eyes of the Russian modellers). But again… running characteristics were far from the normal. Weak and noisy motor, hardly turnable boogies, unreliable transmission. Despite of the above-mentioned and high price, the model faced certain success. Apart of the standard (red) version, limited (blue) version was manufactured. It was the same with exception of color, but priced 15% higher than red one. Current status: very hard to find. Today’s offer: red train in excellent condition at 625 US $. Very nice and interesting items.I found in the old Athens market the Pionerskaya set.When i saw the set i did not have an idea what was it,know with your help i know.I do not know if the set is complete but it is easy to find out if i will decide to buy the set.The seller have the set for at least 6 mounths.Have you an idea how much is a fair price for this set if it is complete? First press Stalin era set in good condition - 3000 US $ (very rare, produced in 1951-1953 only). 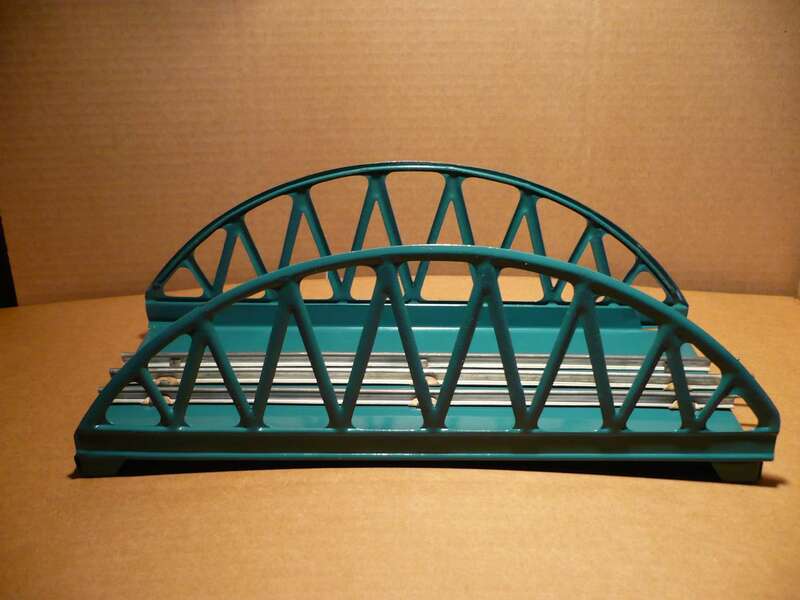 It has arch-over bridge with stretches and green loco with separately attached coat of atms. After 1953 Stalin era sets were still produced, but locos became sky blue or blue, still with letters "IS" and without white coat of arms. Bridges became simplified (manufacturer managed to introduce less labor-consuming production). Fair price would be up to 1400 US $ (depending of condition). In 1960s Khrushchev era sets contained locos without letters "IS" (to dismantle Stalin's cult according governmental decision) and simplified bridges as well. That sets became available commercially - so the fair price would be 700-900 US $. Thank you for the informations. When I drove from Germany to Moscow and St.Petersburg (Leningrad these days) in the mid - 1980s I never saw any Piko anywhere. Was it just necessary to know the right adresses where to buy, or did you need "more" (valuta/swap-goods) to buy these? Thank you for usefull information Andrey.The loco is similar to that we see at the display case,very heavy and solid.I would like to have the set,maybe i manage to have a good deal with the seller if the set is unsold yet. I remember to have read an article in a German model train magazine about the "Ov" set, as a child. As far as I can remember, in this article someone had managed to acquire such a set directly from the Soviet Union. thanks for your comment. You are right - you had to know the right address - Piko was sold mostly in some selected toy/children goods stores in Moscow, Leningrad and other large cities. And you had to come in right time since even in those stores Piko was not in stock permanently. Practically the same situation was with all quality goods imported from the West - they were simply sweeped away from the shop's counters, especially in the end of the Soviet era. Permanent shortage of goods was typical for the Soviet socialism. I recall the Soviet joke - in the foodstore сustomer asks the seller: do you have a meat? The seller: we don't have a fish. Meat is absent at the next counter. PS. You have an excellent picture on the Avatar. Glad that you found my info useful, Panayotis. It would be interesting to know, what set is being offered in Athens. I don't think it's a complete set though, most probably - the part of it. Full sets in decent condition are very rare nowadays. I never heard that this kind of goods were purchased from the Soviet Union remotely - via orders. Most probably that guy visited Soviet Union himself or asked someone to buy it for him or got it as a gift from somebody. was fun too. This train in O scale was probably able to run on O scale American Lionel track. This train in O scale was probably able to run on O scale American Lionel track. thank you so much for your comments. I'm really glad that you liked my post - I knew that it would be interesting for you. You are right - "Pionerskiy" train is able to run on Lionel track since "Pionerskaya" is based on Lionel. Soviets got Lionel railway, carefully studied it and created "Pionerskaya" then. I read in the Russian forums that people looking for some track extention or changing track parts on their "Pionerskaya" are advised to get O-scale Lionel track. When I did visit Moscow last year I actually was at the Train Museum in Moscow,,, Amazing ! I'm glad that you enjoyed my post! Yes, the museum is very good. It's rather new (founded in 2004), but already well-known. Some of the unique stuff attracts visitors from all over the world. Unfortunately, territory of the museum is very limited, it doesn't allow to contain all locos, railcars and rolling stock which could be potentially displayed. As for the Train shop at the cinema - it was closed last year. No-one wanted to buy model trains at a hefty price set there, so closing became the only option. And another large model store at the center also ended it's days last year. Center of Moscow is not about hobby shops at all - rental is one of the world's highest. Thus hobby trading almost moved to the Internet. Thank you for the very interesting photos,we saw something different today. I had really enjoyed it! Great information Andrey, thanks for it ! As I don't see it above in your history, and unless I missed it somewhere, what does this name say to you ? Your question is simply par excellence! The right spelling of the name you refer is "MosKabel" (it means "Moscow Cable", "Москабель" in Russian). And it is manufacturer of the "Pionerskaya" model railway (#2 in my Post). Why it was not mentioned in my post? Actually, serious, well-known sources tell that "Pionerskaya" was designed and manufactured by the "Prozhector" factory, Moscow. However, what we see in the manual of "Pionerskaya"? The manufacturer mentioned on the top of the manual is MosKabel! And I never seen manual where manufacturer is "Prozhector"! 1. Sources telling us that "Pionerskaya" was produced by "Prozhector" are mistaken. 2. "Pionerskaya" was produced by "Prozhector" and "MosKabel", we just can't find proper - "Prozhector" manual. 3. "Pionerskaya" was created by/with participation of "Prozhector", but later was produced by "MosKabel". Two factories were located (and still are) in couple of miles from each other, why not to admit that kind of cooperation. In any case, Yum, I have to correct my first post and put name "MosKabel" together with "Prozhector". I overlooked the info concerning "MosKabel" when created the post. Thank you so much for your very valuable comments and question. PS. I would appreciate if someone correct me or provide more info within above-mentioned versions. Really great info, you have posted very thorough research ... it's quite valuable ! If this isn't allowed, just get a mod to tell me by PM, and remove it. I represent an independent model train manufacturing company named Trans-Siberian Models. We've just recently formed, and we've been working rather hard to get our first model to the point where we're happy to go to pre-orders, confident we'll fulfill them. Our first model is the venerable Soviet era VL8 heavy DC electric freight locomotive, that mainstay of motive power throughout the 1950s, 1960s, and 1970s, manufactured in H0 scale DC and DCC at present. We will be using a combination between traditional and highly advanced manufacturing techniques, as our parent operator is a robotics research company. Its just the boss likes trains. And he likes the idea of robots making trains. We are offering the VL8 in all body styles, and relevant works plate styles for those body styles, choice of relevant liveries, choice of couplers, options for ESU LokPilot decoders (certainly needed for the Buhler motors! ), with non-functional pantographs, and working warm white LED headlights that operate in direction of travel. Pre-order price is US$499 for a base dual section unit, available from TSM's Etsy shop, and will have a projected fulfillment of 12 to 24 months. We are rather proud of our efforts so far, and its been a bit of a rollercoaster ride - but the best part is yet to come. This project will be interesting to follow indeed. That sounds great - should I put the new topic in "Collectors Corner" or do you have a better place for it?